John's Background Switcher is a handy tool that will regularly change your desktop wallpaper to something more interesting. The program accepts images from a huge range of sources. So along with graphics on your own PC, you're able to import pictures from Flickr and Picasa web albums. The ability to work with media RSS feeds means you can connect to sites like DeviantArt and Photobucket. And if that's not enough, support for Bing and Yahoo! image searches will quickly retrieve graphics matching whatever keywords you provide. You don't have to restrict yourself to just one of these sources, though - John's Background Switcher allows you to define as many as you like. Then decide how often you'd like the background to be changed (anything from weekly to once every thirty seconds) and you could stop there, leaving the program to cycle through the source list retrieving pictures as required. 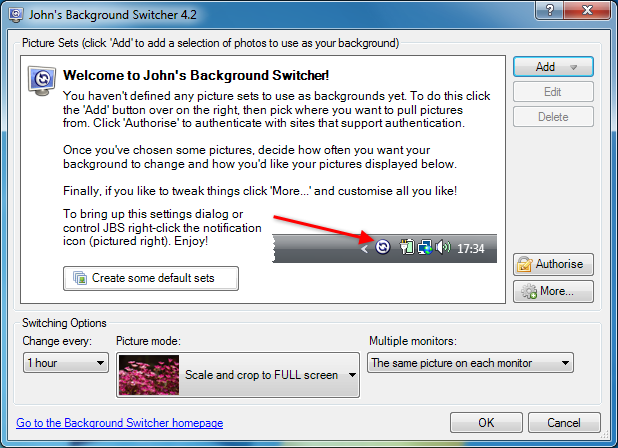 If you feel like exploring, though, John's Background Switcher has many more advanced features on offer. It's possible to use multiple images at once, for instance, to create montages or mosaics. You can define "no draw" zones, areas of your desktop where the background won't be displayed (useful if you have a few desktop icons that may difficult to view with some images). And there's even the option to draw a calendar on the desktop, with a variety of customisable views. - Removed the deprecated Unsplash API endpoints which includes the curated options unfortunately. John's Background Switcher has so much functionality that it consumes more RAM than we'd like, 22MB or more on our test PC. If that's not an issue, though, give the program a try - you'll find it's one of the most powerful and versatile wallpaper switching tools around. I used to use Wally, got tired of it. Discovered this great piece of software with so many locations to choose from. Thanks to downloadcrew team and kudos to the author.